MIXING HUMOUR WITH DRAMA in his own inimitable way, Jackie Chan explodes onto the screen as Special Forces Agent Lin Dong, who is driving frantically through heavy traffic to get to the hospital following an emergency call to tell him his sick daughter's condition has deteriorated badly and her life is hanging in the balance. A second urgent call, from Lin Dong's colleague Susan (Erica Xia-Hou), informs him that their Witness Protection has been compromised and they have lost touch with the key witness in a terrifying high-tech conspiracy that included the brutal killing of a high-profile arms dealer and a scientific team working in a laboratory that was wiped out. Taking on the mysterious and cold-blooded Andre (Callan Mulvey) and his sinister armoured militia, Lin Dong faces danger at every turn while investigating the conspiracy that could well pose a threat to national security. Fighting against all the odds, more deaths and injuries follow as the seemingly bulletproof Andre proves to be a difficult enemy to stop, even surviving Lin Dong's attempt to run him over and leaving Lin seriously hurt before Andre escapes. Lin Dong becomes involved again when, thirteen years later in Sydney, an epic Sci-Fi novel, Bleeding Steel, written by Rick Rogers (Damien Garvey), is about to be published, with Hollywood seeking film rights. There are disturbing parallels to past events included in the book and when Rick Rogers is killed by an unknown assailant in an apparent robbery gone wrong, there appears to be a connection to the secrets Lin Dong had been attempting to uncover. CCTV shows a pink-haired prostitute going to Rogers' apartment, followed by a strange woman in black (Tess Haubrich), who also enters the apartment, demanding to know where the author got the information that appears in the book. Student Nancy (Nanan Ou-Yang) is rescued by Lin Dong from the unwanted attentions of a group of young men and is then followed by young Leeson (Show Lo), who insists upon protecting her. Haunted by unsettling dreams and unsure of whom she really is, Nancy has limited memories of her past and consults a witch (Gillian Jones), who is assisted by a cheeky Dwarf (Sammy the Dwarf). Gradually Lin Dong pieces together the truth behind the conspiracy and surprising links; and once again puts his life on the line to try to track down an arch-criminal whose malice could have dire consequences. If you enjoyed Ghost In The Shell and Blade Runner, Bleeding Steel should be your type of movie. A funny, explosive and impressive thriller that has the superb Jackie Chan's wit and heroics written all over it. Bleeding Steel also features: Kim Gyngell as Dr James; Bowie Lam as Dr Wu; Elena Cai as Xixi; Cosentino as Chamberlain; and Anna Cheney as Television Host. Music is by Peng Pe; Director of Photography: Tony Cheung and Jack Jian; Magic Consultant is Consentino; Screenplay is by Erica Xia-Hou and Chris; Executive Producers include Jackie Chan and Kailuo Liv; Producers are Paul Currie and Aileen Lee; Produced by Javier Zhang; Writer and Director is Leo Zhang. 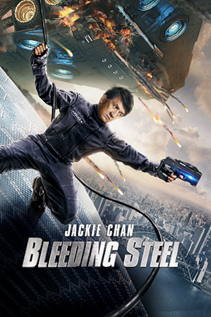 * See Jackie Chan as you've never seen him before in the gripping Sci-Fi thriller Bleeding Steel, which is available for Digital Download from The Movie Partnership from 5 November 2018. VOD/EST Release Details: Certificate: 15 | Running Time: 109 Minutes | RRP: �7.99 SD / �9.99 HD. Release Platforms: iTunes, Amazon, Google, Microsoft, Sky Store, Sony, Talk Talk, Ubiquity.